Our children's garden overlooks a beautiful 17th century chateau. The chateau was originally part of the King Louis XIV domaine in 1700. It has recently been classified as a 'monument historique'. 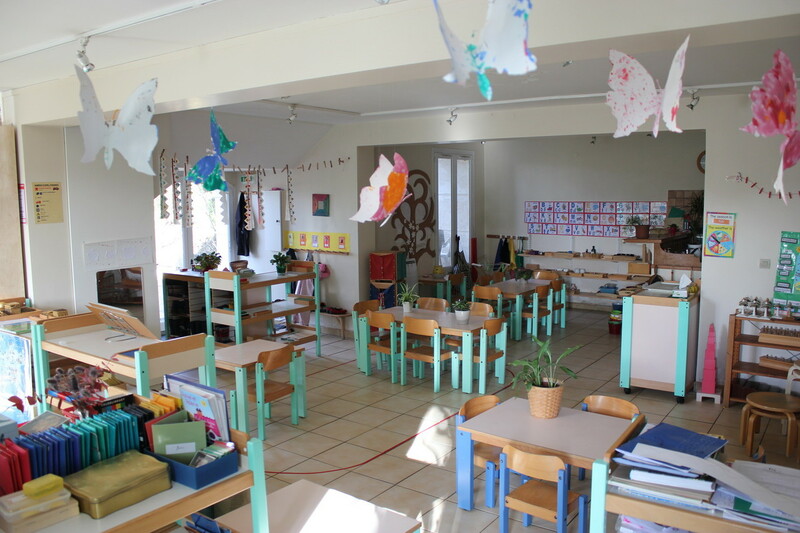 Les classes des 6/11 ans sont situées au premier étage. Au fur et à mesure de l'apprentissage dans cette ambiance, l'enfant est de plus en plus guidé pour compléter son savoir. 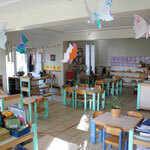 The 6 to 11 years old classrooms are located on the first floor. As children progress and their knowledge develops, they develop more autonomy to be able to work on projects together or individually. La classe d'anglais est dédiée à l'enseignement des matières en anglais (sciences, géographie, ...). La diversification se fait progressivement avec l'apprentissage de l'anglais. Au début, les enfants qui commence leurs appresentissages en anglais se focalisent sur des thèmes plus simples. Les enfants plus aguerris en anglais à leur entrée dans l'école débutent directement avec des matières d'anglais, science et la géographie en anglais. The English-speaking classroom is dedicated to studying the English language as well as learning about science and geography while being fully immersed in an English speaking class. The breadth of a students vocabulary is widened thanks to the teaching of these core subjects in English. Children with a more basic level in the English language focus on developing their rudimentary language skills while also learning about science and geography. As each non-bilingual child's English skills develops, they will take on ever more challenging work. Children who are fluent or bilingual in English deepen their knowledge and understanding of geography and science. They will further their creative writing abilities as well as oral and written comprehension. Our English teacher will talk to each parent about whether your child is ready to take the English Cambridge exams and parents decide whether they wish to have an end of year assessment of their child's English abilities or not. La cours de récréation est recouverte depuis fin 2013 d'un revêtement drainant empéchant les enfants de se faire mal en tombant et de rentrer couvert de boue. The children's garden was entirely renovated at the end of 2013. A new synthetic surface was put down. This has helped ensure the safety of the children and has been particularly effective at preventing them from getting muddy during the rainy Winter months.